On October 31st the Apollo near Earth asteroid 2003 YT1 passed about 3.2 million miles from Earth. In the overall scheme of things that's pretty near. It is a hunk of rock about 1.1 miles across. If it hit the Earth it would leave a mark. 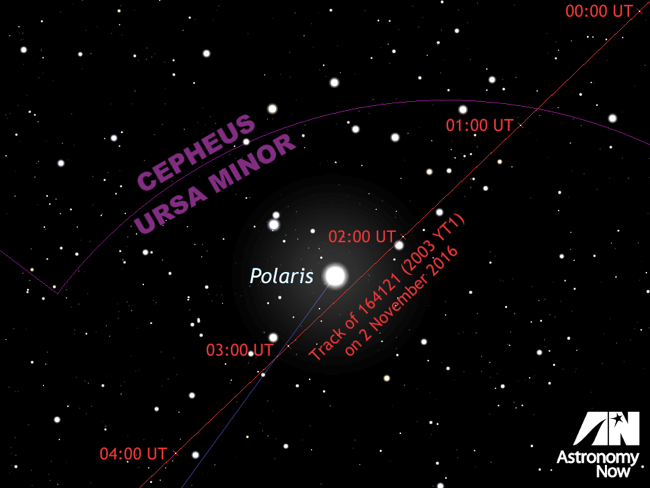 On November 2nd this asteroid was predicted to pass quite close to Polaris between 8 and 9pm local time. Well before my bedtime. At a magnitude of about 11.5 it would be an easy target with just a camera...and for someone with brains. To call this a spectacular failure wouldn't be completely out of line. In order to take a picture of something going by the north star it helps a lot to actually have the camera pointed AT the North Star. I used my Canon T6i and a Sigma 35-250mm zoom. I've never used the camera for any nighttime specific target shooting with just one of its lenses, and for sure I've never used this zoom lens zoomed all the way in at night. That bright star down and to the left of center LOOKED like Polaris on the LCD screen when I was lining things up, but about 15 minutes into the shoot I could tell it was moving across the viewfinder way too fast. Oh well. It was fun to try. This was about 35 minutes of pictures taken every 30 seconds with peeks at the image as it flashed on the LCD. That's why the star images are lots of little blocks on the left side. The breaks are while the camera was saving the image and I was peeking. Where the trails get a bit dim is where some cloud bands moved through the area. The exposures were 30 seconds long at f/6.3 and ISO6400. I probably could have turned that down a little, but I had no idea what I was doing, or how faint of an object I was going to get. I just sat next to the tripod and used the camera's wireless remote to trigger the shutter. When I was finished I offloaded the pictures to a laptop and dragged and dropped them into the program StarStaX on my MacBook. 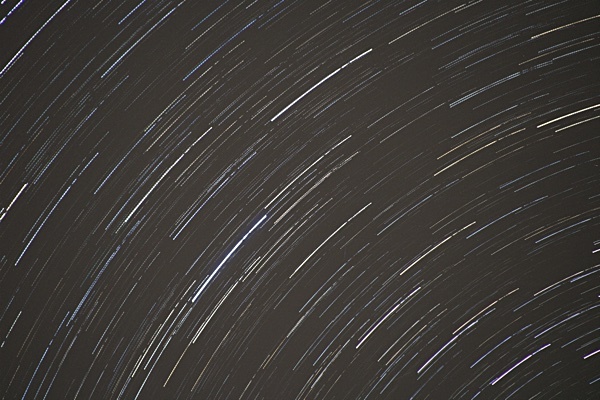 I'd never done any of these star trail pictures before. The program made it really simple. The glow is part Socorro, part Albuquerque, and probably sensor amp glow. 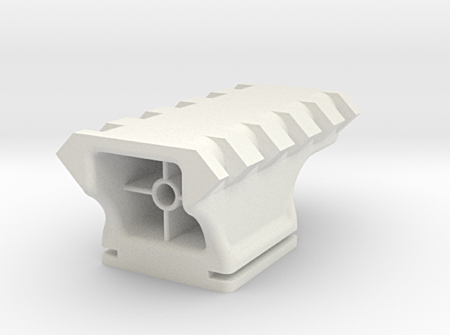 So in preparation for the next asteroid, or whatever else may pass by, I've ordered one of these 'gun sight' star finders to mount in the hot shoe of the camera. 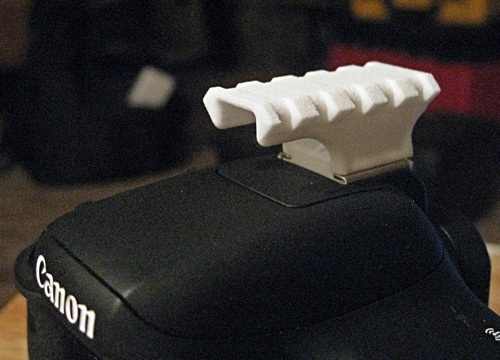 It's a 3D printed thing I ordered from Shapeways.com. You find what you want, order it, and they print it and send it. Pretty neat. It's kinda like the food replicators in Star Trek, other than the week delay, and the 3D things not being food safe. We'll see if I can get the camera pointed at the right star next time. Update: The real thing. Very nice.